The Bread and Puppet Theater (often known simply as Bread & Puppet) is a politically radical puppet theater, active since the 1960s, currently based in Glover, Vermont. Its founder and director is Peter Schumann. The name Bread & Puppet is derived from the theater's practice of sharing its own fresh bread, served for free with aioli, with the audience of each performance as a means of creating community, and from its central principle that art should be as basic to life as bread. Some have heard echoes of the Roman phrase "bread and circuses" or the labor slogan "Bread and Roses" in the theater's name as well, though these are not often mentioned in Bread & Puppet's own explanations of its name. The Bread and Puppet Theater participates in parades including Fourth of July celebrations, notably in Cabot, Vermont, with many effigies including a satirical Uncle Sam on stilts. The Theater was founded in 1962–1963 in New York City. It was active during the Vietnam War in anti-war protests, primarily in New York, prompting Time reviewer T.E. Kalem to remark in 1971, "This virtual dumb show is as contemporary as tomorrow's bombing raid." It is often remembered as a central part of the political spectacle of the time, as its enormous puppets (often ten to fifteen feet tall) were a fixture of many demonstrations. The troupe, started by Peter Schumann, was initially inspired by a Sicilian puppet show, and itself went on to inspire other groups across the continent, including Gary Botting's Edmonton-based People & Puppets Incorporated, which in the early seventies also used effigies yards high to depict political themes and social commentary in in-your-face street theatre. In 1970 the Theater moved to Vermont, first to Goddard College in Plainfield, and then to a farm in Glover where it still resides. The farm is home to a cow, several pigs, puppeteers and chickens, as well as indoor and outdoor performance spaces, a printshop, store and large museum showcasing over four decades of the company's work. The Bread & Puppet Theater has received National Endowment for the Arts grants and numerous awards from the Puppeteers of America and other organizations. In 1984 and 1985 they toured colleges with an indoor play, The Door, which told the story of "the massacre of Guatemalan and El Salvadorian Indians and the plight of refugees trying to escape through a diabolically opening and closing door to the North." With "only minimal use of the spoken word", the play made its points "with great simplicity and beauty." 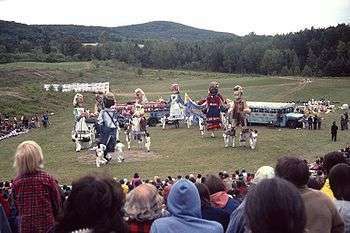 Until 1998 the Bread & Puppet hosted its annual Pageant and Circus (in full, Our Domestic Resurrection Circus), in and around a natural amphitheater on its Glover grounds. In the 1990s the festival became very large, drawing crowds in the tens of thousands of people who camped on nearby farmers' land over the summer week long of the pageant. The event became unmanageably large and less and less concerned with the theater's performance. In 1998 a man was accidentally killed in a fight while camping overnight for the festival, and director Peter Schumann subsequently canceled the festival. Since then the theater has instead offered smaller weekend performances all summer long, and traveled around New York and New England, with occasional tours around the U.S. and abroad. The theater runs a program where apprentices help produce and act in performances. In New York City, Bread & Puppet annually performs at Theater for the New City during the holiday season. Bread & Puppet volunteers were among the 79 people arrested at a warehouse in Philadelphia during the 2000 Republican National Convention. The Associated Press reported that the scene of the "SWAT-style" raid was broadcast live by news helicopters. Years later, the AP explained that there "was tense talk (later proved unfounded) of terrorist plots being hatched in the 'puppetista' headquarters, of bomb building and anarchist-fueled mayhem." Its report did not include the police's side of the story. "A couple of our folks were down there, helping to build puppets", said Linda Elbow, company manager for Bread & Puppet. "The cops went into the studio...arrested people, and took the puppets. So, now, puppets are criminals." The Bread & Puppet Theater is a regular participant in New York's Village Halloween Parade, noted for its use of giant puppets. In 2001, Bread & Puppet did not march in the parade. The Theater's plans that year included a presentation protesting the war in Afghanistan. The Halloween parade was to occur fifty days after and 1.5 miles away from the September 11, 2001 attack on the World Trade Center. It was this attack which was the pretext for starting the war Bread & Puppet Theater was protesting, and the company's "anti-war stance" reportedly "...already placed it at odds with some New Yorkers", according to Dan Bacalzo of TheaterMania.com. Many of the parade's macabre elements were suspended that year by its director Jeanne Fleming. It was not known until October 25 whether it would even take place. Elbow commented, "We certainly weren't saying 'Hooray for the terrorists.' We were saying, 'Look what you're doing to the people of Afghanistan.'" An unattributed quote in Bacalzo's report — "What you're bringing, we don't want" — suggests it was the group's selection of material that was unwelcome, not the group itself. The report did not make it clear how the decision was made, or who made it; the incident was included as secondary background material in a piece publicizing an upcoming Bread and Puppet show. Fleming, who was not interviewed by Bacalzo (but is quoted as if she was), says that Bread and Puppet was not "disinvited", adding that it was she who first invited the company to march in the parade when she took over as organizer. In December 2001 the Theater returned to New York with The Insurrection Mass with Funeral March for a Rotten Idea: A Special Mass for the Aftermath of the Events of September 11th. It was presented at Theater for the New City, and billed as "a nonreligious service in the presence of several papier-mâché gods." The "Insurrection Masses" are a common format for the Bread & Puppet Theater, as are such "Funerals", though the "rotten" ideas change. In addition to the theater, some of the Bread & Puppet puppeteers operate the Bread & Puppet Press, directed by Elka Schumann, who is Peter Schumann's wife (and granddaughter of Scott Nearing). The press produces posters, cards and books on the Theater's themes as well as other forms of "cheap art." The broadsheet Why Cheap Art? Manifesto is among the press's best-known products. Notable writers and performers have participated in the theater, including children's theater performer Paul Zaloom and writer Grace Paley. Other writers to have praised Bread & Puppet include historian Howard Zinn, who cited its "magic, beauty, and power", and poet and NPR commentator Andrei Codrescu, who wrote: "The Bread & Puppet Theater has been so long a part of America's conscious struggle for our better selves, that it has become, paradoxically, a fixture of our subconscious." 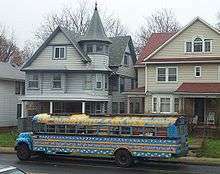 The Bread & Puppet Theater is visually referenced in the 2007 film Across the Universe, directed by Julie Taymor. Schumann was approached by the film's producers and asked if he would make puppets for the film. He told them to build the puppets themselves. Notable characters replicated for the movie include Uncle Fatso, Washer Women, White Ladies, and the many armed Mother head. The Bread & Puppet Circus Band is also visually referenced in the costumes of the circus band during "Being for the Benefit of Mr. Kite! ", the only notable difference in costume being that the band in the movie wears white and black, rather than the traditional red and black of the Bread & Puppet Circus Band. The Bread & Puppet Theater is noted in the film credits. ↑ Personal interview with Bread & Puppet company members, 2007. Ronald T. Simon and Marc Estrin, Rehearsing with Gods: Photographs and Essays on the Bread & Puppet Theater (ISBN 1-931498-19-9). George Dennison, An Existing Better World: Notes on the Bread & Puppet Theater (ISBN 1-57027-072-4). Stefan Brecht, The Bread & Puppet Theater (2 vols., ISBN 0-416-01691-X). DeeDee Halleck and Tamar Schumann, "Ah! The Hopeful Pageantry of Bread and Puppet!" 2002, 70 minute video. Wikimedia Commons has media related to Bread and Puppet Theater.